If you are going to be an effective recruiter, you need to continually change your mix of recruiting tools in order to stay ahead of the competition. Adopting new tools is critical because once any tool is used by everyone, it loses its effectiveness. In part one of this article, I provided a list of bold sourcing, referral, event, and college recruiting tools. In the second part, I continue the toolkit with advanced recruiting tools for the most aggressive recruiters, and bold closing tools for getting difficult to land candidates to say yes. Direct poaching from your competitors. Nearly every firm is beginning to realize that if you want up-to-date, well-trained top performer , in most cases you have to recruit them away from your competitors. Start by building talent maps of the top people at your talent competitors and attempt to build relationships with them over time. Recruit on the right day when recruiters initially contact desirable individuals who currently have a good job, they often respond with a resounding no. But these same individuals may change their perspective almost immediately after they experience a negative triggering event at their current firm. This negative event might include the fact that their boss/friend just left, their budget has been cut, or a major project proposal of theirs has been rejected. In the same light, when a competing firm is undergoing stock price reductions, staff reductions, mergers, or other turmoil, it makes sense to immediately increase your recruiting efforts and to target all of the troubled firm’s best people. Use the mobile platform. It is no secret that employees everywhere love their smart phones because they carry them 24/7. Smart recruiters take advantage of the power of the mobile platform by tailoring their recruiting approach to take advantage of its features. Make sure that your corporate website is compatible with smart phones, and then use it’s text, picture, voice, and video capability to communicate your recruiting messages. Take advantage of social networks. Having recruiters spend hours building profiles on social network sites can be expensive. Instead, shift some of the responsibility to your employees because there is a high probability that your employees currently use one or more social networks already (i.e. Facebook, LinkedIn, and Twitter, etc.) both on and off the job. Start by encouraging your employees to include in their profiles compelling facts and stories about the firm. Next, encourage them to proactively make group connections and to convert the best into referrals. Develop talent communities talent community is a group of outside individuals who share an interest in a functional area. Develop a website for these talent communities and encourage those who have an interest in your firm to join and participate. Make sure that the focus is primarily on learning and professional development, so that non-job seekers will periodically visit it. Over time, identify and build recruiting relationships with all desirable prospects. Push jobs openings to top prospects develop the capability on your website to push relevant job announcements via email or text to individuals who you are targeting or that have expressed an interest in receiving position announcements. You can also send them a periodic e-newsletter highlighting the exciting things that have recently happened at your firm. Use technical contests. Many who participate in contests are often employed and are not active job seekers. As a result, offering online technical challenges or contests can help you identify, build relationships, and hire the very best professionals. Hire-them-both buddy program. This is a variation of the successful U.S. Army program. When you encounter an exceptional candidate, offer to hire them and their best friend at the same time (i.e. colleague, college friend, or spouse/ partner). This may provide a desirable candidate with an opportunity to commute together or to work together with a best friend. Same-level calls. Many individuals simply refuse to return calls from recruiters. Instead, have someone at their professional level in their discipline call them, and you will get as much as a three times higher response rate. The reason for this is professional courtesy and the opportunity to learn from someone in their profession. Write technical articles. The best recruits are continuously learning, have your best professionals write articles in industry newsletters and journals. Many who will never read job ads or recruiting pieces can learn about your firm and its practices in technical articles. Being written about for your best practices is also an excellent branding tool. Use Google ad words. The very best in any field are constantly searching for information and occasionally for jobs. As a result, placing company information and job announcements on Internet search page results can be effective. Use traditional media. Advertising openings on the specific radio stations that your target recruiting audience listens to can be powerful. Also consider ads in movie theaters and billboards along major commute routes to a competitor facility. Recruit through community groups. Encourage leaders of community, service, and church groups to make referrals and to let you speak at their events. Welcome wagon services, realtors, and the Chamber of Commerce may also be able to provide leads on individuals who have recently moved into your community. Offer free training. Offer top prospects who you’re trying to build a relationship with an opportunity to fill any vacant seats in your training classes in order to build a relationship and to assess their capabilities. Promise them an interview. Many potential applicants have a fear of being rejected, so consider guaranteeing recruits who meet the minimal education and experience requirements an interview. Giving them a reward (a $25 coffee card) if they show up for an interview can also increase the number of candidates. Direct mail. Prospects receive very little hard-copy mail these days, in addition to text and e-mail messages, consider using professional association, website, and industry magazine mailing lists to mail out hard-copy recruiting pieces. Make interviews more accessible. People who are currently working have difficulty scheduling and attending multiple interviews without placing their existing job in jeopardy. Make interviews easier to attend by making changes to accommodate their schedule. Consider dedicating at least one night or weekend day a month to allow individuals with scheduling issues to interview outside of work hours. Or use live Internet video interviews that do not require travel. Also, consider instituting a policy where all interviews are completed during a single day. Ask candidates for their job acceptance criteria. Selling top-quality candidates is always difficult, but you can make it much easier if you start out by asking each candidate up front to identify their expectations and the key factors they will consider when evaluating an offer. In addition, have them outline dealbreaker factors that would cause them to drop out of the process or not consider an offer. Tailor your assessment/selling approach so that you end up providing them with compelling information demonstrating that you meet each of their acceptance criteria. Develop a company sell sheet. Many managers do a poor job selling the company to potential recruits. Rather than trying to build up their sales skills, survey your key employees to identify the specific factors that make your firm superior to your competitors. And then compile a list of these compelling features  that hiring managers and recruiters can use to better sell your firm. Also provide them with a side-by-side opportunity comparison sheet showing where your firm’s opportunities are superior to each of your competitors. You can also attach a version of this sell sheet to your hard-copy application form and show it on your application website immediately before the application process begins. Peer interviews. Many organizations have found that they get a significantly higher acceptance rate if candidates are interviewed primarily by the individuals they will work directly with. Because peers know the job, they can be more convincing and at the same time, more believable than hiring managers. Select a hiring team. Some managers just are not good salespeople or recruiters. So instead of relying on individual managers to hire, identify a group of your employees that excel at selling candidates and let them do most of the hiring. Give them recruiter training and reward them for their efforts. Because this group will do a lot of hiring, they will naturally be better at it than a single manager who only does hiring once or twice a year. Ask new hires, why did you say yes? You can dramatically improve your recruiting sales pitch over time, if you ask all new hires during on-boarding, what specific elements of your firm’s recruiting and branding pitch had a positive influence on your decision to apply and accept? Use this information to improve your sourcing, marketing materials, interviews, and the offer process. Dream job offers. The most effective attraction and sales tool is offering top candidates their dream job. For top candidates, ask them to describe the non-monetary aspects of their dream job and then offer it to them (within reason). Incidentally, most ask for things that are relatively easy to provide. Show them where they will be in two years. Provide top candidates with a profile of what others like them have accomplished and learned while at your firm. Excite them by showing them where they could be in a year or two if they were to join your firm. Use exploding offers. Candidates who are likely to get multiple offers need to be closed very quickly. Try offering a significant sign-on bonus that is contingent upon accepting your offer either before they leave your facility or the same day. If the offer is not accepted right away, the bonus continually decreases over the next few days. This bold approach can provide a powerful incentive to accept or make a quick decision. Firms can produce excellent results provided that they give their recruiters and hiring managers the most-effective recruiting tools. All of the tools listed here have proven to be effective, so why not break out of tradition and try something new and bold! 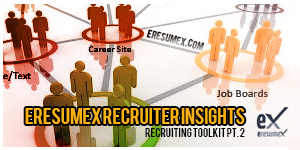 As always, you can count on EresumeX as your free Job and Resume search portal.